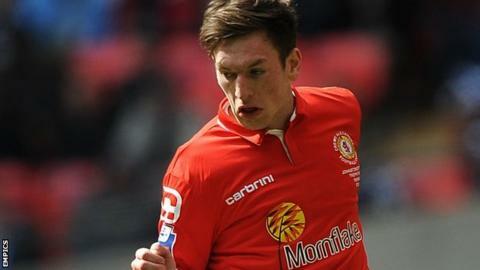 Crewe Alexandra defender Matt Tootle will not let speculation about his future distract him from the battle to avoid relegation. The 23-year-old, who signed a new two-and-a-half-year deal in February, has been watched by Championship clubs Burnley and Blackburn. Crewe are third-from-bottom in League One and just a point away from safety. "If it happens, it happens and great. But until then I play for Crewe and I'm here to help," he told BBC Radio Stoke. "In the past we have won promotions and trophies, so I just want to keep us in the league this season. "Maybe people do come to Crewe to get a move or whatever, but in my career to be fair I've been with Crewe all my life." Since graduating from the youth ranks at Crewe in 2009, Tootle has made 179 appearances for the club. He missed three matches in November with a foot injury, but immediately reclaimed his place at full-back and has started the last three games. Tootle feels his stature in the team is bringing the best out of him. "Mentally for me, I just like to know that I'm important to the team. I feel that I am and that I'm needed - that is good for me," Tootle said. "It also means I have to step up to the plate and I like to think I am at the moment to help the team. "I just want to be consistent and when I've been fit I've been in the team. "We have got plenty of games to go and I want to do what I've done in the first half [of the season] in the second half."